what does C mean in ingredients? what does C mean? … cup measures explained! Our experiences influence our perception of what is “normal” – not just the big things like family dynamics but the small things too, like how we measure out ingredients or how we express ourselves. It has come to my attention that I have some such quirks here on my humble little blog, so this is an attempt of clear communication about the C in my ingredients. I learnt to cook as a child in Egypt where I had a little yellow and white cup I measured everything out with. So it is most natural for me to use cup measures in my baking. It is the easiest way to get little children measuring out ingredients accurately, especially as you can now purchase cup measures. When I was a child half a cup meant half of the yellow and white cup! I think that it is probably a more rustic or International approach to measuring ingredients, and those of you who grew up here are more used to the precise measurement of weight! But it works for me and my son and happily you can buy cup measures really cheaply on amazon. 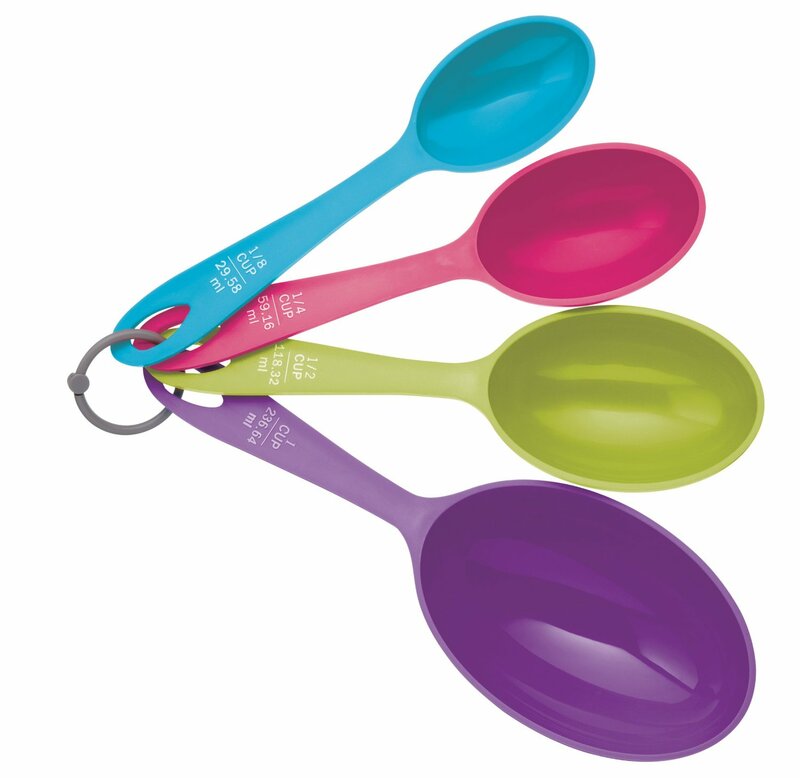 I use metal cup measures as they are hardy and can be 100% cleaned, but you can also get cheery colourful plastic cup measures which are like big spoons, these only cost £3.18. There are very many options available to you, lovely polka dot jug-like cup measures. I use simple, cheap and cheerful ones but the other day at our local National Trust shop I spotted these gorgeous ceramic mason cash measuring cups, with a price tag to match and I know that if I “invested” they would be smashed before I had enjoyed my return on them! That said – whilst flitting about on Amazon to provide links for you I spotted them for a quarter of the price!! 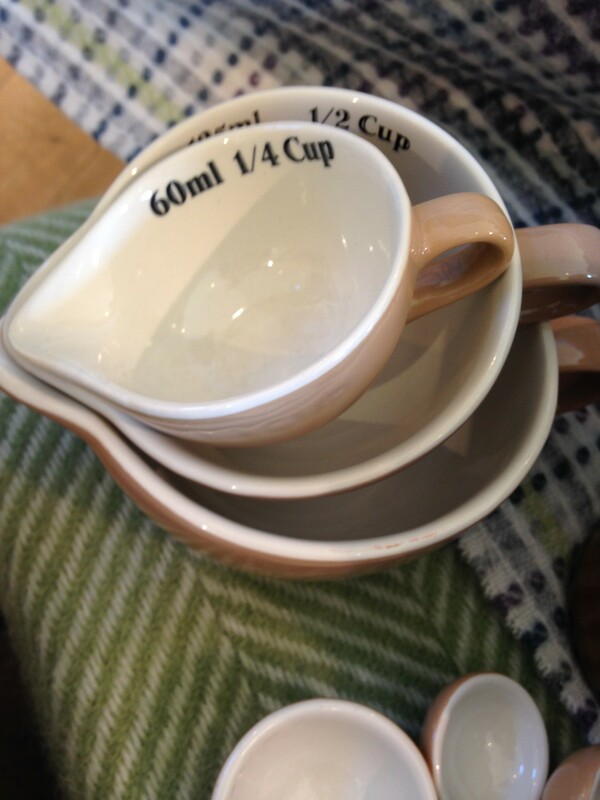 I also spotted some cool collapsable cup measures for folks with limited storage space! Hopefully you can find something that suits, so that you can enjoy allowing your child to measure out the gluten-free flour pretty accurately with the cup measures. Be warned it can still get a bit messy 🙂 I hope that you can find some cup measures that suit your kitchen so that you can enjoy all our recipes on free2bake.com! Would love to hear from you if you have any other questions or queries about my wording or methods in baking!